You think you’re having a bad day when the food delivery service is slow, someone has stepped on your foot on the metro again or dripped coffee dripped on your dress, a colleague was rude to you…Well, just thank your lucky stars you’re not a child from a Russian village a century ago. Your hands turned red and became numb while washing clothes in the river during winter. At the same time, a young child is crying at home. Three other children, who already know how to walk, have runoff every which way. It wouldn’t be a bad idea to feed them lunch, but to do that you first need to clean the bowls, light the stove, and then prepare something on the fly. No, this isn’t a typical day of a mother with a large family. This is the drab existence of a ten-year-old girl from a Russian village 100 years ago, when child labor wasn’t considered exploitation, and the age of ten was no longer within the realms of childhood. What seems to us like a quest for survival today was standard practice back then. While today we wouldn’t let our children go to these places alone (even armed with GPS), in the past it was a common practice. The dense forest could provide you and your family a carefree existence. Here, children were sent to gather berries, mushrooms, herbs, and kindling. Kids had to learn how to navigate forests and fields pretty quickly. It all began with taking care of the chickens, and gradually, by the age of ten a girl was “old enough” to handle a cow or goat. She would milk them and then send them to pasture. This would require getting up at five in the morning. However, this was the most she would do when it came to livestock. Cleaning manure, and washing and grazing animals - these jobs were only entrusted to boys. Today with the help of a mixer this process only takes about 10-15 minutes. Back then, it would take about three hours. Physically enduring the whole process of churning butter with only a wooden spoon was torture, so everybody took turns - well every woman and girl in the family at least. Everyone loves splashing around in the river during the summer, even if you had to wash clothes, this was great fun. But during the winter it was a different story, as the cold hung around for six months of the year. Poor little girls were sent to wash the family’s dirty washing before having to hang it up with swollen red hands. Not fun. Another item on the list of skills this universal soldier in a skirt was forced to master: A ten-year-old girl knew she was expected to dig up worms for fishing. It was believed that a girl should gather (which means make) her dowry by herself and she began this process approximately from the age of ten. This way she had a chance to have an impressive dowry chest by the time her wedding came around, and thus elevate her status as a good bride. All fabric for clothes, towels, tablecloths, and other things were made by hand. 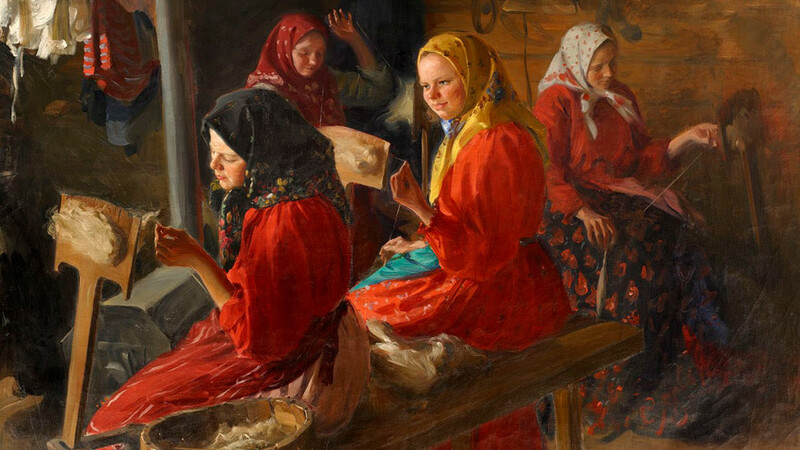 By the age of seven she could skillfully comb flax, spin threads from it, and wind them onto birch spools. By the age of ten she could work on a loom and make belts or embroidered towel. As a rule, all the women in the family worked on this during the winter, when there was no work in the field. What can be said with certainty is that in the olden days even children were prepared for parenthood. Because watching the younger children fell on the older siblings’ shoulders. Even if there was only a few years age difference. For example, when all the adults were working in the fields someone would have to look after the kids. In many families a ten-year-old girl would feed a baby herself from a rozhok(a homemade bottle made from the horn of a cow or ram) - and she would make a pacifier from chewed bread and a small piece of cloth. Sometimes she went to babysit for other families too. Attacks on Russian schools: Are they similar to the Columbine massacre?